Sadly, Phil passed away at his home. Days later, police discovered him, with Bandit by his side, on Feb. 6. They took the 10-year-old dog to the County of Los Angeles – Agoura Animal Care Center. 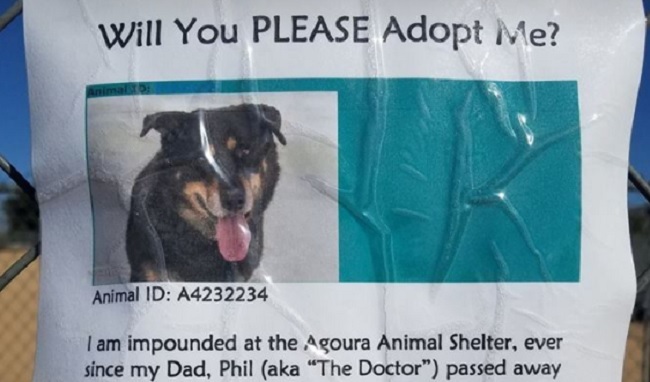 When a kind-hearted dog park regular found out about Phil’s death and his senior dog’s situation — it’s a sad but true fact that older dogs have much more difficulty getting adopted and making it out of shelters alive — they posted a flyer on the dog park fence with Bandit’s photo and ID number. Amy Mandel took a photo of the flyer and posted it on Facebook, where it was shared over 4,800 times. Congratulations to Bandit and many thanks to his adopters and everyone who helped ensure he found a forever home. The saying that it takes a village is really true, and in Bandit’s case the “village” was a dog park community.